Scientists from Porton Down have been deployed in the UK a "number of times this year", the government's head of counter-terrorism has told MPs. The lab mainly specialises in nuclear and biological warfare but the reason for the deployments is not known. Brigadier Chip Chapman told a committee of MPs he could not go into details for national security reasons. 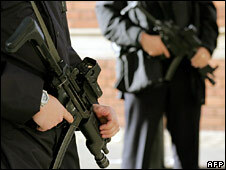 The Commons defence committee is probing the UK's level of readiness for a terrorist or other emergency. Lord West said ministers did not know the location and capability of all deployable troops in the UK at any one time but he was confident they could find out "straight away" in the event of an emergency. The security minister said government agencies were now better informed about the counter-terrorism forces and scientific capabilities available to them - and a compendium had been made available to officials. Brigadier Chapman told MPs "immediate response" teams from the Defence Science and Technology Laboratory (DSTL) had been deployed on a number of occasions in the past year. "The number of occasions they have been used and the circumstances I can not go into in this forum," said Brig Chapman, director of counter-terrorism and UK operations at the ministry of defence. The DSTL, which is based in Wiltshire, is the UK's leading biological and chemical defence research centre. It also develops a range of other technologies for military and civilian use, including X-ray scanning equipment and armour. On the broader question of whether the UK was prepared for a major incident, Lord West confessed he did not know how many hospital beds could be made available in the event of an emergency of the order of 10,000 deaths. But he said the Department of Health "would know" the figures and plans would be coordinated by the government's emergency planning committee Cobra. The security minister also said progress was being made on preventing young people becoming "radicalised" but he said it was going to be a long process. He said he accepted Britain's foreign policy was a "problem" for some young Muslims but the government was now "engaging" with them. "This isn't going to change just like that. To stop this radicalisation and extremism is going to take - and I get into trouble for saying this - about 30 years, I think. "But it will become a virtuous circle, it will start getting better and better and we have to embark on it and the recognition of that I think is one of the big things that has happened over the last 15 months." He said Britain could not "arrest and protect ourselves out of this problem" and the government was "putting work into prisons, into places of worship, into sports clubs" to tackle extremism. But he added: "I don't pretend for a moment that we are nearly there. I regularly go out and talk to youngsters and some of the reactions I find just amazing, because you think 'how on earth can you believe that' but you need to have a dialogue." Lord West was also quizzed on whether the government was actively studying ways in which terrorists could launch an attack on the UK. He said "red teaming," as such scenario planning was known, did take place to a limited degree and various "what if" scenarios were constantly being worked through, including how terrorists might target the UK's financial system. He also raised concern about maritime security, saying that there was still no way of tracking all shipping movements in British waters. "In the skies, we pretty well know what is moving, but we don't know that in the waters around our country," he said. Lord West also stressed that the government's counter-terrorism strategy had saved "hundreds if not thousands of lives". The peer said he could not go into details about specific plots but measures such as doubling the size of the security services and increasing surveillance were working. The government is due to publish a new national security strategy next spring, Lord West told the MPs, and it was preparing to unveil plans to make intelligence chiefs give evidence in public, something first flagged up in March. Explaining the delay, Lord West said the prime minister had been "busy with other things". He said the government was still considering appointing a minister to act as a "national security adviser," similar to the role played by Condoleezza Rice in the US. Armed Forces Minister Bob Ainsworth was quizzed about plans to shoot down passenger jets judged to be a threat. He assured the committee that the final decision would rest with "an elected minister" and that steps had been taken to protect RAF pilots from the psychological impact of shooting down a civilian aircraft.